150 years ago, on February 23, 1869, a young Samuel Clemens, better known by his pen name “Mark Twain,” came to Trenton. He drew a crowd to the Taylor Opera House on South Broad Street where he gave a speech on the topic of his then-recent trip to Europe and the Holy Land. At age 34, Mark Twain was just beginning to make a name for himself at the start of his great literary career. In 1869 Mark Twain was gaining recognition for his special brand of satirical humor and as a travel writer. But most of his celebrated accomplishments were still in his future. For example, Mark Twain had worked as a steamboat pilot on the Mississippi River before the American Civil War, but his much-read book Life on the Mississippi (1883) was years in the future. In 1869 the City of Trenton and the entire United States were entering an era of unprecedented industrial growth and prosperity. 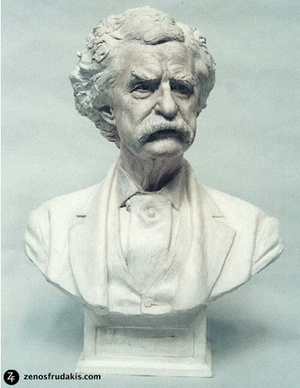 Mark Twain himself gave the name to this historical era in his novel, The Gilded Age: A Tale of Today. Historians have applied this title to the post-Civil War period. The United States had just concluded a catastrophic Civil War and a period of economic depression. The Museum’s commemoration of Twain’s visit spotlights the early career of Mark Twain and the transformation of Trenton that was underway at the time of his visit. The Museum has located a copy of the speech that the satirist gave on his Feb 23, 1869 visit to Trenton. The Museum also has located a copy of a second talk given by the humorist on a return visit to Trenton at the end of 1869. Copies of both speeches are on display and available to interested visitors. Both speeches had a public relations function intending to arouse interest in two books by Twain that were about to be published: Roughing It (1869) about his travels in the American West and The Innocents Abroad (1870). The Innocents Abroad was the best-selling book of Twain’s long career, with sales during his lifetime exceeding both the semi-autobiographical The Adventures of Tom Sawyer (1876) and his masterpiece Adventures of Huckleberry Finn (1885).